hireabl provides next generation hiring technology that revolutionises the process of sifting, sorting, assessing and ranking candidates, dramatically reducing the time and cost of recruiting and improving the quality of the candidate short list. What Background Check solution do you use? VICTIG is the nationwide leader of employment background checks, background screening, drug testing, county criminal searches, education verifications and employment verifications. HireRight is a leading provider of on-demand employment background checks, drug testing, Form I-9 and employment and education verifications. CareerBuilder Employment Screening is a business savvy, economical and adaptable solution for screening services that consolidates background screening, drug testing, I-9 and occupational health services it reduces manual intervention, provides extensive business intelligence, mitigates hiring risks, and delivers a unified and powerful applicant experience. GoodHire simplifies and speeds background checks with customizable, on-demand services for organizations of all sizes. More than 75,000 employers benefit from GoodHire’s advanced technology that makes background checks easy, fast, accurate and compliant. IntelliCorp makes background checks and employment screening easy, safe, and comprehensive for organizations throughout the United States. Sterling Talent Solutions provides hiring peace of mind by delivering a simpler, smarter background screening and onboarding experience for employers worldwide. Checkr provides simple, fast and compliant background screenings for Enterprises and Startups. First Advantage offers a comprehensive suite of talent acquisition solutions and technology to thousands of clients globally. HireSafe is an employment background check company. Their online platform provides background screening services, industry specific programs and enterprise suite technology. Their innovative and client-driven background screening programs come with robust account management with quality and employment law compliance. * We monitor all Pre-Employ reviews to prevent fraudulent reviews and keep review quality high. We do not post reviews by company employees or direct competitors. Validated reviews require the user to submit a screenshot of the product containing their user ID, in order to verify a user is an actual user of the product. Hi there! 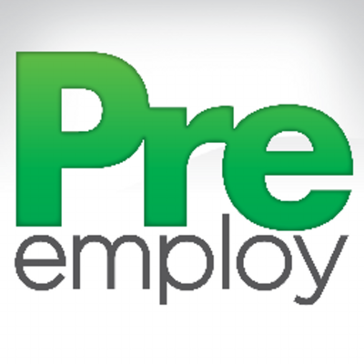 Are you looking to implement a solution like Pre-Employ?